Corn muffins are notoriously tough as leftover material. Muffins in general are really best the day they are baked, and corn muffins get really dry quickly. A few days ago, after a chili supper with friends, I had five corn muffins leftover. As the corn chips and chili goodness disappeared and it became obvious there would be leftover muffins, I began to contemplate this very real dilemma. Usually, I put the muffins in a plastic container, leave them on the counter, and then throw them out a week later when they develop blue fur. And then it hit me. Everyone knows corn muffins are da BOMB with honey. What about with maple syrup, reintroduced as a breakfast treat? 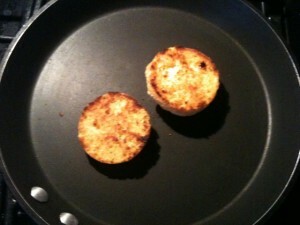 The next morning, I sliced and buttered a muffin, and grilled it on a skillet. Then, I schmeared one half with peanut butter and drizzled maple syrup over the whole shebang (a favorite combo from childhood). 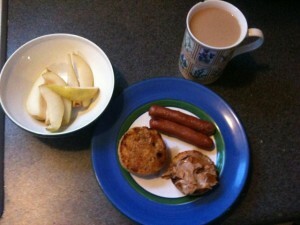 Along with a couple turkey smokey link sausages, a pear, and a cup of coffee, it was very much a nice breakfast. Nice enough to repeat until all lonely little corn muffins were gone. What magical leftovers have you dreamt up lately?